Welcome! 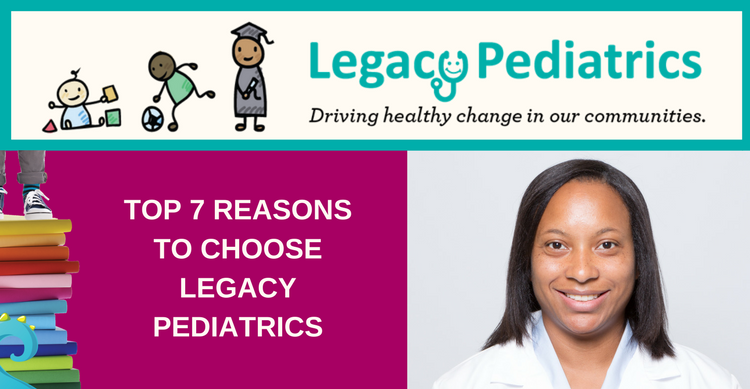 I am so excited to launch our new digital series, “Legacy Pediatrics.” We hope this will be a place to discuss health topics affecting our youngest patients, ages 0 to 18. Our goal is to provide parents with accurate, quality medical information affecting their kids and diverse communities in which they live. Keeping children healthy begins at home – well before we see them as patients! I joined Legacy because we focus on a child’s whole health – from physical to behavioral health, to education and prevention. And we see any child – or parent – who walks through our doors, without judgment. We want our pediatric patients to see the same pediatric team whenever they come in for appointments. This allows us to know your child’s individual concerns and medical history – which means we can provide the highest level of care. We treat your children like our own, since, after all, we’re parents, too. If your child is a student at Houston’s KIPP or YES PREP charter schools, they can see a nurse practitioner in one of our 16 school-based clinics. From asthma management to vaccines, pink eye to ear infections, we offer convenient care right where your kids are. And many of our other clinics stay open past 5pm and on Saturdays. Puberty and adolescence can be a challenging time. That’s why we have physicians specializing in the unique needs of patients ages 10 to 18. Legacy believes treating the mind is as important as the rest of the body. We offer behavioral health care specialists with expertise in children’s behavioral and mental health needs, such as ADHD, autism, depression and anxiety. Patients six months to age 12 can take home a free book at each well-child visit through Legacy’s Little Reader’s program. Partnerships with H-E-B and the Barbara Bush Houston Literacy Foundation allow us to take our “prescription for reading” out to the waiting room before appointments. Kids don’t come with an instruction manual, so we offer classes on breastfeeding, diet and nutrition, parenting and much more. We accept most insurance plans including HMOs, PPOs, Medicaid and CHIP. If you don’t have insurance, you won’t be turned away. We have programs to lower the cost of your health care services.